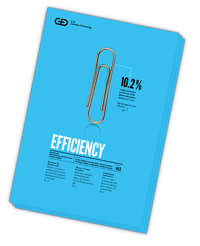 In the era of digitalization, efficiency is less a question of productivity. Instead, it is the adequate handling of various forms of disruption. Those companies who are truly lean are best prepared. They understand the importance of cash, logistics and productivity for growth in a highly competitive market. G+D Currency Technology provides solutions for tomorrow’s cash logistics processes. Download it now and sign up for our G+D Currency Technology Newsletter!